The UMass Lowell women’s lacrosse team turned around a 7-2 deficit in the middle of the first half into a 9-9 tie with 12:09 left to play in a nailbiter against Dartmouth College on Saturday, Feb. 18. The River Hawks ultimately fell to the Big Green 11-9, but they sent a message with their strong play: they are not in the vicinity of playing around in their third season as a Division I program. Head Coach Carissa Medeiros said that the game against Dartmouth was the best season opener that the women’s lacrosse game has ever had, due to the team accomplishing goals that they had set for themselves. “We managed the ball on offense better than we ever have, we took opportunities when we needed to and we played as a team and had a whole heck of a lot of fun,” coach Medeiros said. Sophomore attack Jane Dudley had a hat trick, the first in her collegiate career. Junior attack Taylor Sokol and sophomore midfielder Kristina Keith added two goals of their own. Sophomore midfielder Kendyl Minelli had four assists, two of them coming on Sokol’s goals. Goalkeeper Courtney Barrett had another great performance making 11 saves for the River Hawks, including several that came at key moments of play. Barrett stood tall during a tense situation with 6:20 to play in the game, preventing Dartmouth from capitalizing at a crucial moment. “I think overall this is a giant step forward for us… I’m very proud of them, and I’m very excited to see how we can build off of this,” said coach Medeiros. Dudley scored the first goal of the game 2:10 into the first half, an unassisted effort off of a free position attempt. The River Hawk squad looked more comfortable on the field than they have in games past, driving up more time in the circle in the first half. While they slipped back on possession time in the middle of the first half, UMass Lowell began and ended the first half by controlling offensive zone time. UMass Lowell stayed calm under defensive pressure from Dartmouth on their offensive drives, not allowing Dartmouth to capitalize on ground balls during a particular section of the first half. While the River Hawks would sometimes leave one Big Green player open, junior goalkeeper Courtney Barrett was aggressive in the net and made several big saves. Dartmouth scored six straight goals in the first half, but the River Hawks were able to keep the Big Green from scoring in bunches. Eight minutes and 46 seconds passed between Dartmouth’s fourth and fifth goal, in part due to UMass Lowell’s strong defensive presence. “I think that we were really great about keeping our sticks up, and slowing down the opportunities for [Dartmouth] to get easy looks to cage. I thought that we limited the amount of balls that were thrown into the middle,” said coach Medeiros. Coach Medeiros was proud of the way that the defense conducted themselves, but pointed out some areas where she felt they could improve. “I definitely think that we have room to grow as far as making some better decisions when we do come up with the ball moving up the field in transition. I think that’s going to be a big focus for us this week,” said coach Medeiros. As the first half waned, the River Hawks climbed back up in zone time, driving up their offense. The first half ended with the River Hawks down 7-3, as sophomore attack Rebecca Ibson scored UMass Lowell’s third goal with four seconds remaining. Despite a slow start to their second half, mostly playing in their defensive zone, the River Hawks gave a thrilling thirty-minute performance as they scored six goals, one of those to tie the Big Green late in the game. The River Hawks’ fortunes changed once Sokol jabbed in her first goal of the game past Dartmouth goalkeeper Charlotte Wahle’s left side to make it an 8-4 game early in the second half. 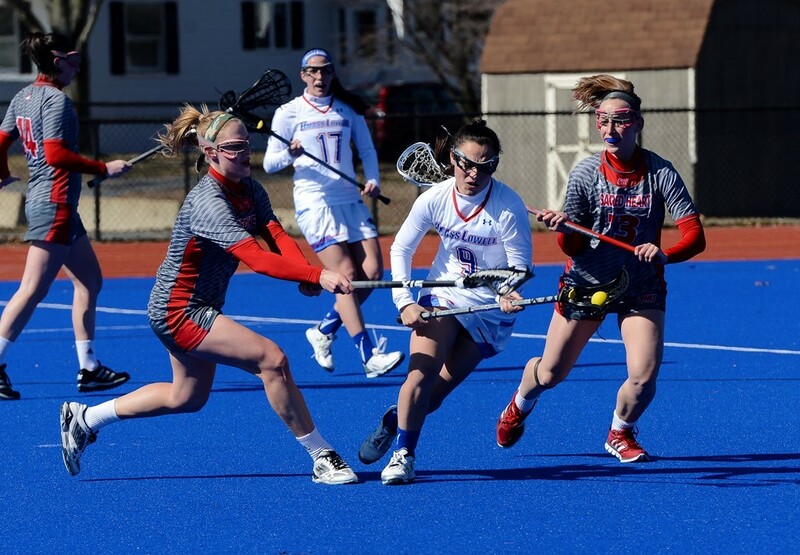 There were several moments where UMass Lowell’s offense shined, particularly during a sequence in which freshman midfielder Hana Caster knocked the ball off of a Big Green player and charged to the net, kickstarting an offensive drive. Caster set up Keith who scored to make it 8-7 with 20:44 left to play in the game. Dartmouth scored the game-winning goal with 10:55 remaining in regulation and added their eleventh goal with 7:21 left, but the River Hawks continued to press until the clock ran out. “If we can limit our unforced errors in the midfield transitioning the ball up the field, I think that that already is gonna make us a little bit more evenly matched with teams,” said coach Medeiros. The women’s lacrosse team will play their second game of the season at Boston University on Feb. 25, and will return to Wicked Blue Field for their third game of the season against Iona College on Mar. 4 at 1 p.m.